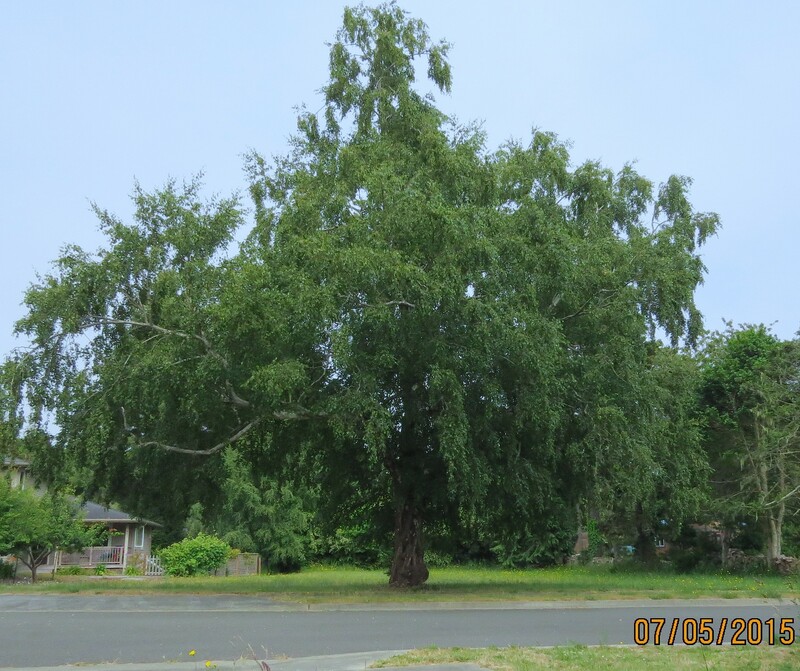 June 9…Here is how the tree looked last month. I know, I know, I didn’t post it last month. It wasn’t because I got into a disagreement with a police officer about how long to wait for someone in the crosswalk before turning right. Nor was it because I wanted to watch the first episode of Poldark on Masterpiece Theatre, or maybe it was. 🙂 in any case, I promise to be more punctual in the future. When the valley gets hot, clouds get sucked in from the ocean, resulting in cloudy weather on the coast, and less than perfect picture-taking weather. A River birch can grow as tall as 70 ft. (21 meters) if it’s a single trunk. 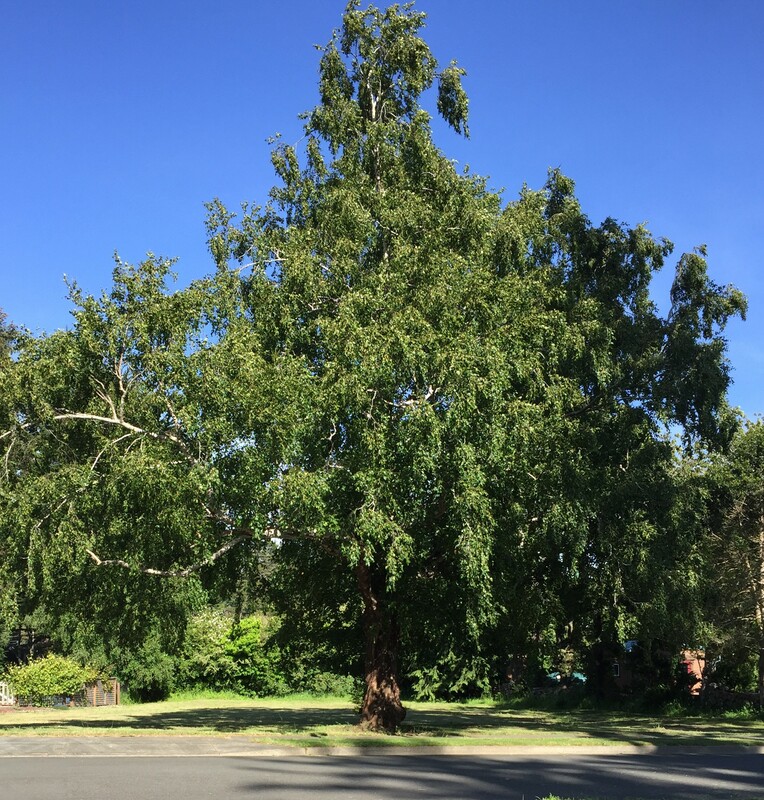 If the trunk branches out, the height will be limited to about 50 ft (15 m) with a 40 ft. breadth. It requires acidic soil which is consistently moist. It grows along waterways or at the edge of wooded areas, or in this case, on the edge of someone’s property. Last month the leaves and catkins looked like this. I believe these are male catkins which point in a downward direction. 7-5-15…This month I don’t see much difference except for the lack of contrast from overcast picture taking. 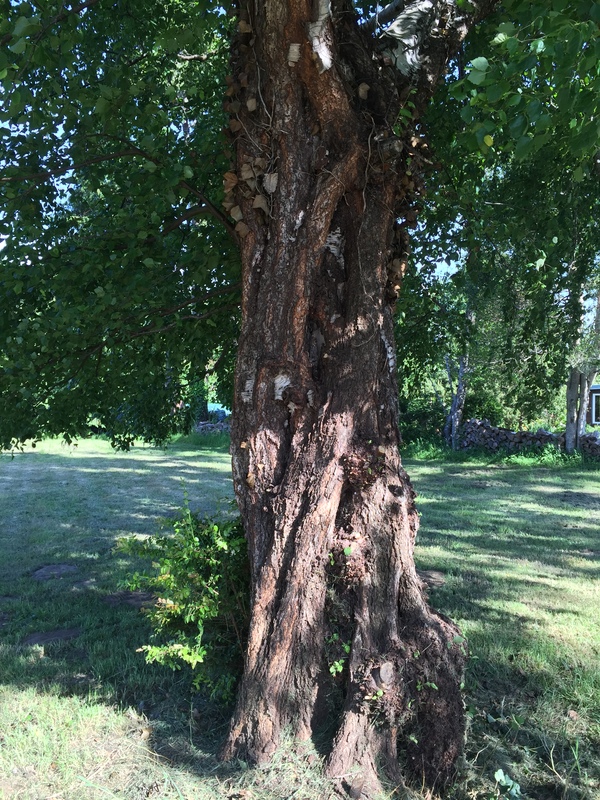 6-9-15…What a rugged and gnarly trunk. As the tree matures (40 years) the bark thickens, darkens, and becomes deeply fissured beginning at the bases of the trunks. This tree must be over 40 years old. 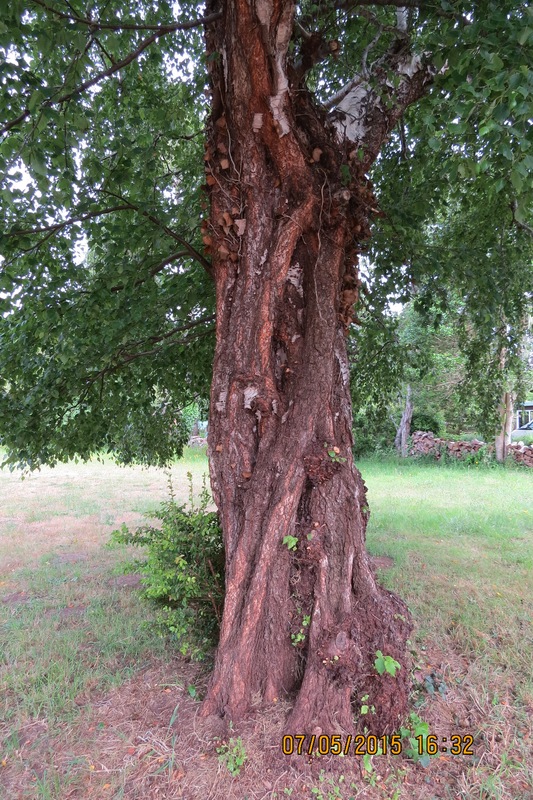 July 5…another look at the trunk of the River Birch. One of its characteristics is that bark exfoliates revealing the multicolored layers of the inner bark. This can be seen towards the top of this trunk. 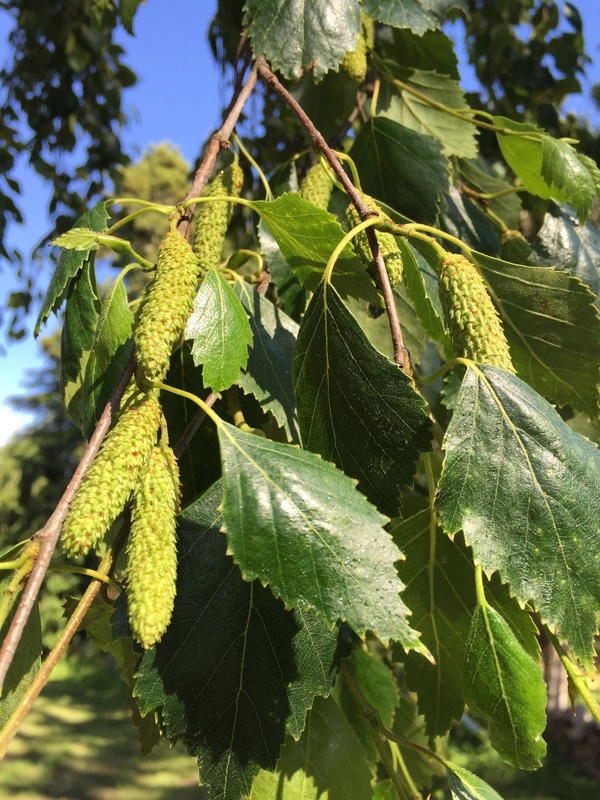 According to “The Master Gardener at University of Wisconsin,” River birch naturally forms just a single trunk, but is sometimes sold in multiple-trunked form with two to five trunks per tree. 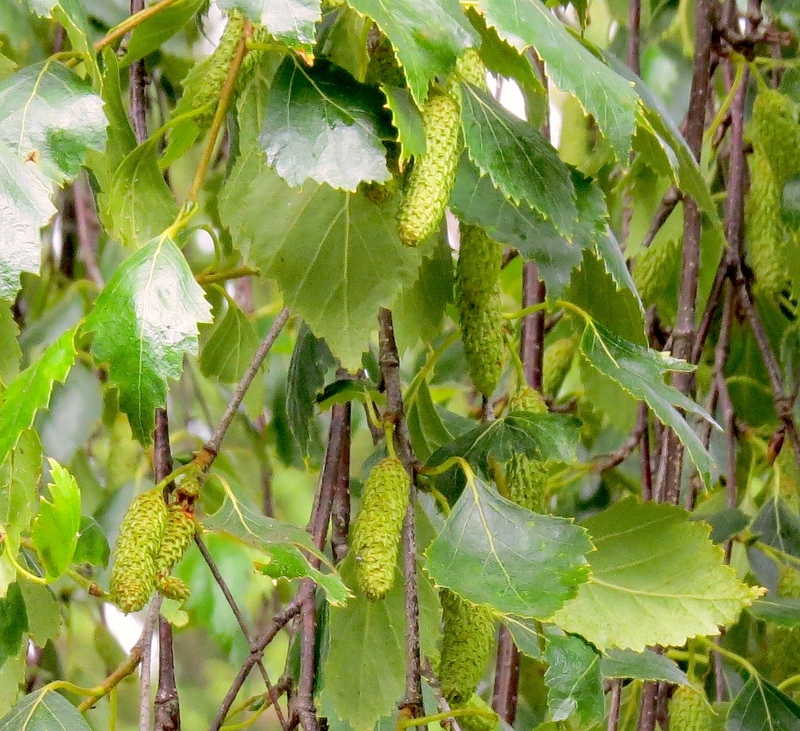 The River birch can thrive in damp soil, but it can also take a certain amount of drought. Birch roots, along with willow and poplar, are among the most aggressive — and destructive — tree roots. The tree’s aggressive roots seek water, prying open cracks or joints in sewer or irrigation systems. Note: I’m about 85% sure this tree is a River birch. The 15% uncertainty is because when I compare this River birch tree trunk to the River birch tree trunks on the internet, I don’t see any like this one. Furthermore, the catkins look slightly different too. If there are any birch tree experts out there that would like to make a correction, please feel free to do so.